The Dutch is recognized for their groundbreaking radical movements--whether it's in design, how they vigorously enforce gender equality, their luscious art community, or even their overall soft attitude towards soft drugs--the Dutch tends to play outside the usual conventional box. Which is why when we heard that their national postal service (TNT) had commissioned Gummo, (a design/advertising agency) to create a sheet of augmented virtual reality stamps based on a some exceptional Dutch architectural structures that currently remain unrealized, it didn't really come to us as a surprise that the Netherlands' national postal house had decided to experiment with the good-old-stamp--perhaps as an innovative and brilliant attempt to re-market the not-as-popular-lately air mail--given the ascendancy of email culture. 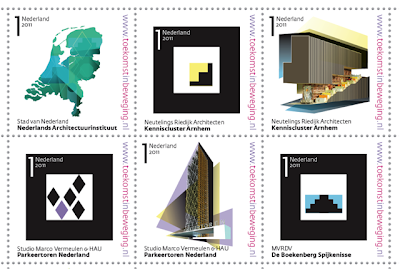 Gummo has collaborated with the Dutch Architect Institute to select from the five leading architecture firms in the country: MVRDV, SeARCH and ZUS, Neutelings Riedijk Architectural Studio Marc Vermeulen & HAU to showcase their upcoming projects in the form of some Dutch national stamps that can be experienced in mini three dimensional digital configurations. The design agency is employing their Augmented Reality (AR) rendering digital techniques to make the unrealized buildings come to three-dimensional-life. Once you have one of the limited stamp collections in the palm of your hands, you can just scan it into your computer's camera--and voilá--AR architecture in full effect. Have a watch at the demo (above) to have the full visual effect of these 3D stamps all the way from the Netherlands.